At this point, we’re starting to sink our teeth into the game – memories still linger of the earliest previews and the narrow window into Breath of the Wild we got last year – now that world has truly opened up. Be warned – this is a mammoth post! 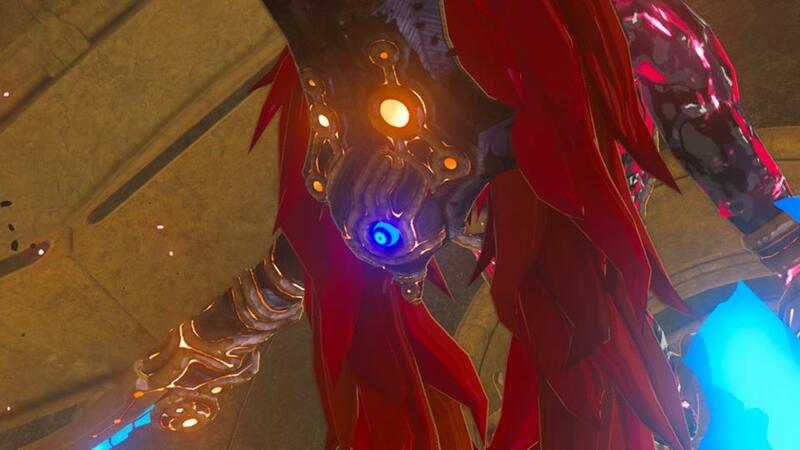 In chapter 4 we’d been set the task of finding an heirloom of the Gerudo, a headdress that can deflect electrical attacks from the Divine Beast that’s roaming the desert. 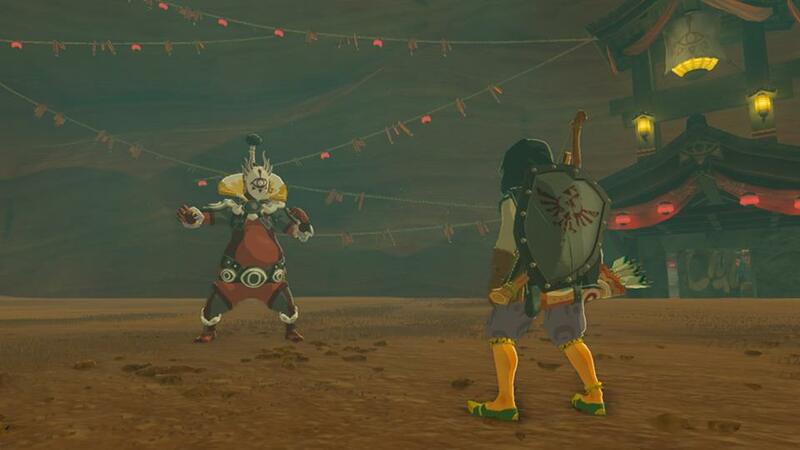 In order to find this headdress, I had to seek out the Yiga clan (whom I had mistakenly referred to as the Riga earlier, and who are a corrupted band of Sheikah), at their hidden camp. This meant a sandseal ride up there, followed by a steady ascent up a hill into the heart of their territory, and engaging a few archers who kept using their powers to jump about the place – though they were ultimately dispatched without too much difficulty. Once in the Yiga lair, I had to first uncover a hidden passage in a chamber filled with drapes that I had to burn down. After that, it was a simple matter of going in, and grabbing this headdress – right? Right?! No. This is a Zelda game, and Zelda games are rarely as straight-forward as this. Cue one of the elements of gaming I tend to loathe – the ‘sneaky bit’. I spoke with a Gerudo prisoner (oddly, rescuing her didn’t seem to be an option) and was advised there were far too many guards to fight – but that I could use bananas (yes, seriously) to distract them. I got caught a couple of times and swiftly learned there was no way to fight my way out of this one. On the third attempt I successfully managed to use a combination of stealth and bananas(!) to bypass the guards and ended up in what looked like the personal chamber of one of the guards. This is where the game once again showed off clever subtly. A pair of chests were embedded in the sandy floor – using my magnetism, I pulled them up and discovered that one of the walls of this chamber was also metallic – and could be swung open. Off I went, and encountered a boss fight – with the leader of the Yiga clan. I expected this to be a lot tougher to be honest. Or maybe years spent playing Zelda games prepared me. Either way, big boss Yiga went down hard. His first attack involved throwing spiky balls at you – whilst he summoned them, he was protected behind a shield, but as he prepared to throw them, the shield vanished. Shooting him with an arrow led to the ball falling on him, and he was briefly vulnerable to hacking and slashing. Next, he floated into the middle of the arena (a giant pit that reminded me of the Sarlaac pit from Return of the Jedi) and created two balls, which span around him slowly, before throwing them too. I waited for one to be above him, then shot him again, and once again the ball landed on him, which had the effect of bouncing him back onto the sands, where more sword attacks weakened him. His final move? A bigger ball, that he would wave at me in a manner akin to my magnetic power, so I used that, and sure enough, swung the ball back into him. Defeated, the boss proceeded to create an even bigger ball, as part of his bluster about how he would crush me – only for the ball to roll into him and send him down the pit. Heirloom retrieved, it was time to face my first Divine Beast. First, a sandseal trip to reach it, and the young Gerudo chief accompanying me. She wore the headdress and this created a shield to prevent powerful electrical strikes from killing me – provided I stayed under the shield. She also handed over bomb arrows, which were vital in disabling the Beast’s feet and briefly stopping it. On my first effort, I slipped out from the shield just as the Beast attacked and was instantly killed. On attempt two, I was successful, and climbed aboard, into the belly of the Beast. 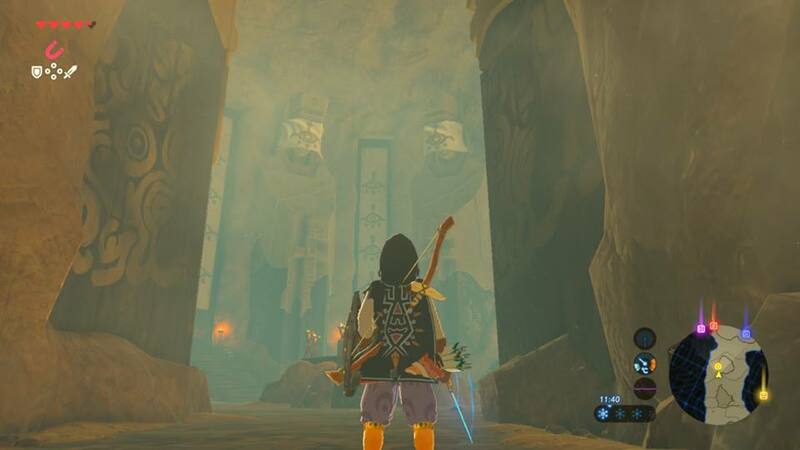 I guess you might say that this is the first dungeon I’ve encountered in the game, though it’s unlike any dungeon I’ve previously faced in a Zelda game. Once you reach a particular console you can rotate three interior sections of the Beast, and it’s through doing this that you eventually unlock new areas as you try to reach and activate several terminals. The purpose is to regain control over the Beast, and there’s not a particularly large quantity of enemies here – it’s more the level design that’s the challenge. I don’t mind admitting to a fair degree of trial and error here, but eventually I got through and activated all the terminals, before returning to the central chamber – where the master terminal rested. Of course, it’s never that simple. Activating the main terminal released a powerful creature – a creation of Ganon’s, Thundershock Ganon (I think that was its name). I tried to fight this thing a couple of times, but its speed and power overwhelmed me every time. Thanks to the nature of this game, I can return to it later on (and I plan to), but first, I need upgrades, and to that end, set off scouring Hyrule for that very purpose. 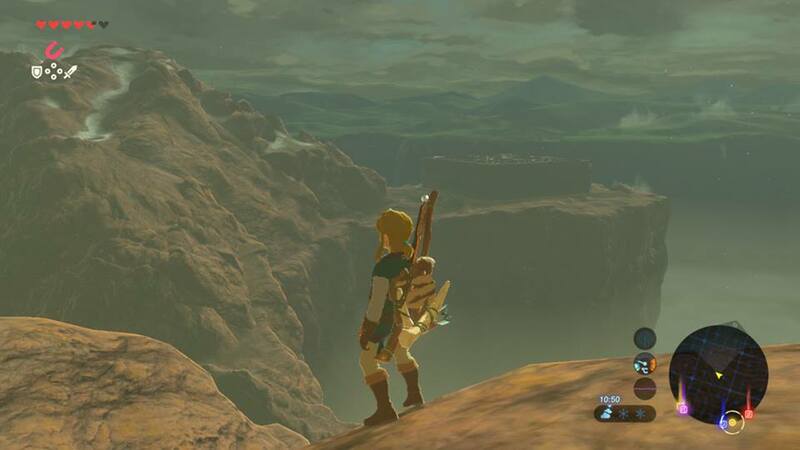 I took a wander to the north of Hyrule Castle, trying to find a way into the Lost Woods (which you can’t paraglide into, sadly), which I learned from a stable is the home of the Master Sword (want!). I wound up going a lot further north than I’d planned, and found a fascinating Shrine in the guise of a maze, filled with powerful lizard creatures. 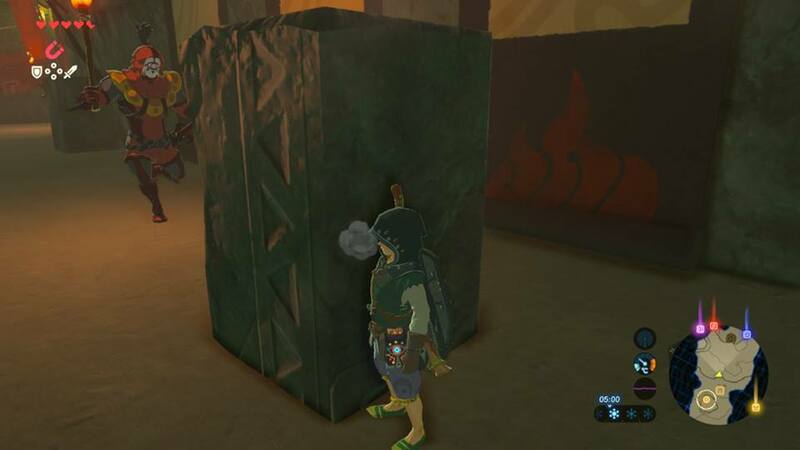 Completing the maze allows you to enter the Shrine, and you get a prize for doing so, without having to deal with any further fun and games. 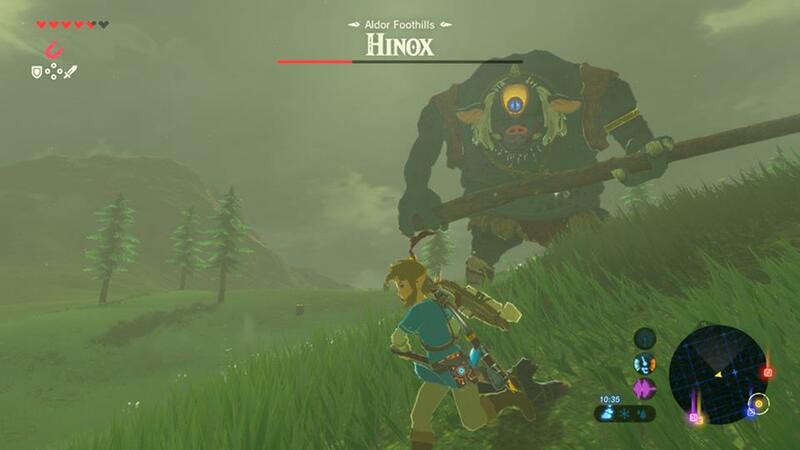 I also had an encounter with another giant Bokoblin – and nearly killed the thing before a stray strike killed me! In what felt like a developing theme, I once again decided to deny this thing battle, instead seeking to strengthen myself. The stable from earlier had also revealed something else – a man there told of great treasures inside Hyrule Castle, and a means of entering via a dock to the north. From elsewhere (I forget where) I’d heard of a secret passage to the east of the Castle – I don’t plan on fighting Ganon any time soon, but if there are weapons and items in the Castle that can be of use, then might it be worth a raid? Another little bit to add – I inadvertently unlocked some more memories during my travels – it seems that Zelda felt like a failure, especially compared to Link and his own achievements with the Master Sword – and even more so once Ganon struck down Hyrule. 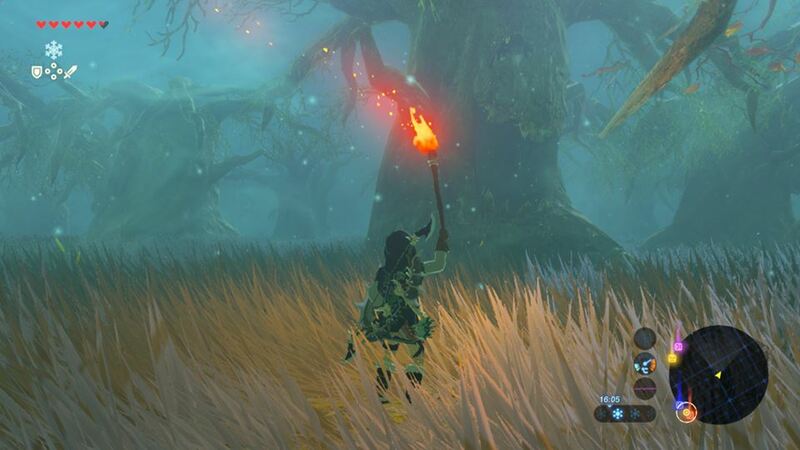 It has to be said that the Lost Woods in Breath of the Wild are a brilliant, atmospheric and slightly creepy take on a classic bit of Zelda lore. Take a wrong turn and a mysterious mist will quickly envelope you and send you back to the start of the forest – which is filled with trees with monstrous faces by the way. After more than one failed attempt to navigate the Woods, I did in the end find myself in Korok Forest – and there, nestled by the roots of the Great Deku Tree (yes, the Deku Tree), was it – the Master Sword! Could I have it? No, no I couldn’t – the Sword requires a great deal of strength to wield, and I don’t have that – yet. 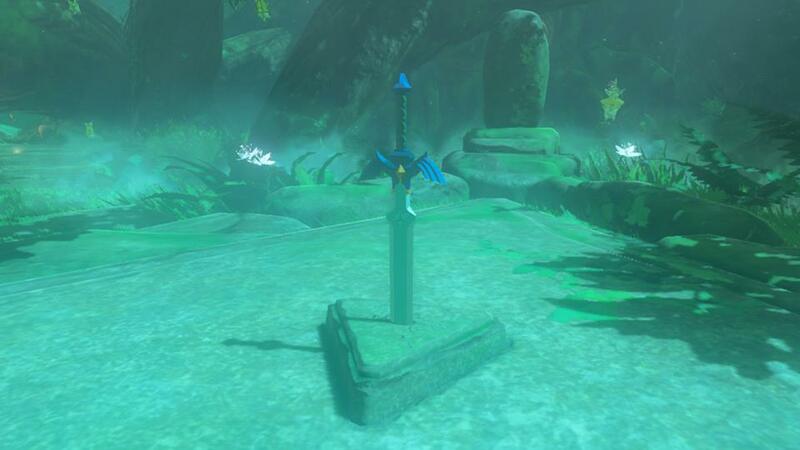 Attempting to pull the Sword from its stone saps hearts – it’s apparent you need to complete more Shrines and build up your power before drawing the Sword. 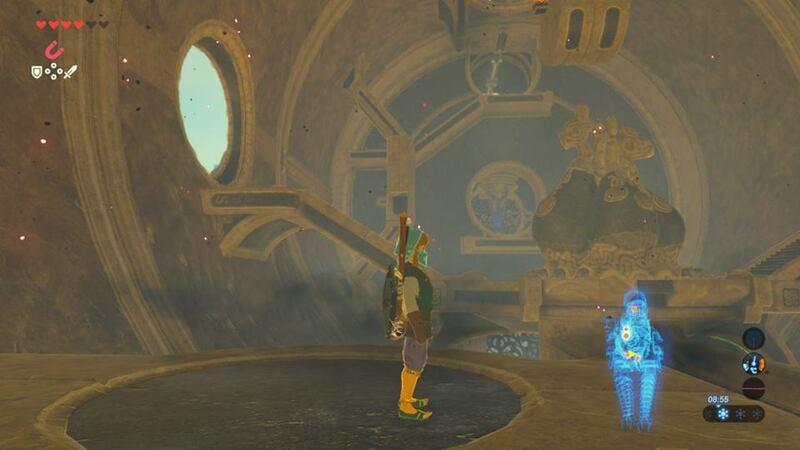 I did complete four Shrines within the Woods – and another on my way eastward, and then another – in Zora’s Domain. Hang on – what was I doing there? 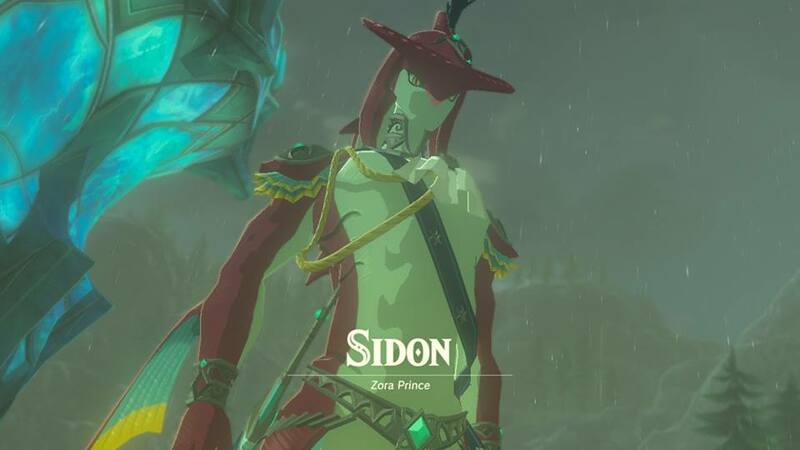 Well, during my trip east, I was accosted by a Zora – the first time I’ve met one up close – who got me to seek out the Zora Prince, who in turn asked me to journey to Zora’s Domain. 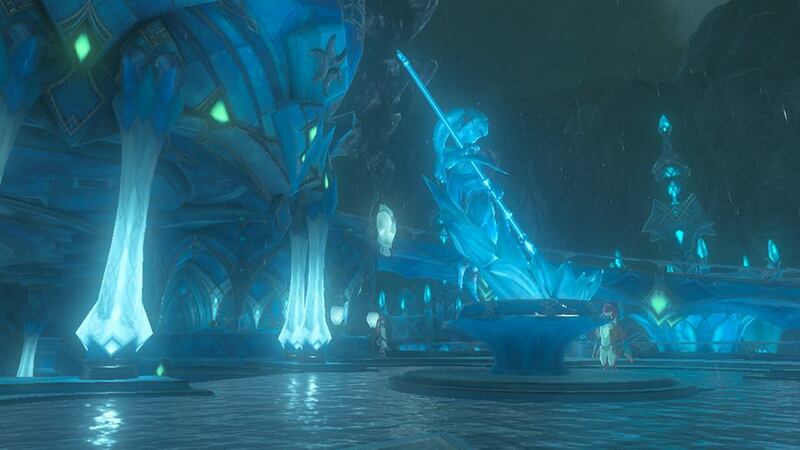 This trip involved several enemies of various types, and this is also where this chapter ends – next time, will I be able to help the Zora? When will I return to the desert to deal with the Divine Beast there? And how many Shrines will it take to wield the Master Sword?